The cataloguing in many places (even in reputable libraries) of works by the Jacobean playwrights Francis Beaumont (1584-1616) and/or John Fletcher (1579-1625) and/or their various collaborators tends to be confusing. Works by Fletcher alone can be found catalogued under Beaumont or under Beaumont & Fletcher; works by Beaumont alone can be found catalogued under Fletcher or under Beaumont & Fletcher; collaborations by Beaumont & Fletcher can be found catalogued under Fletcher alone or under Beaumont alone; collaborations by Fletcher and Massinger can be found catalogued under Fletcher alone or under Beaumont & Fletcher; –and some works are catalogued correctly! Collected and selected editions usually include a mix. (These confusions occurred even in the 17th century.) Here’s a breakdown: it’s a lot, but all of these are present in single play volumes or in Beaumont & Fletcher collections listed on LT.
Works by Beaumont alone: The Knight of the Burning Pestle; Salmacis & Hermaphroditus; Masque of the Inner Temple. Works by Fletcher alone: The Faithful Shepherdess; Bonduca; Valentinian; The Woman’s Prize, or, The Tamer Tamed; Monsieur Thomas; The Island Princess; The Loyal Subject; The Mad Lover; The Pilgrim; A Wife for a Month; Rule a Wife & Have a Wife; The Chances; The Wild-Goose Chase; Women Pleased; Wit without Money; The Humourous Lieutenant, or, Demetrius & Enanthe. Works by Beaumont & Fletcher and Philip Massinger: Thierry & Theodoret; Beggars Bush; Love’s Cure. Works by Fletcher and Massinger: Barnavelt; The Custom of the Country; The Double Marriage; The Elder Brother; The False One; The Little French Lawyer; The Lovers’ Progress; The Prophetess; The Sea Voyage; The Spanish Curate; A Very Woman. Works Printed with the Beaumont & Fletcher canon but which are by other authors altogether: The Nice Valour by Thomas Middleton; Wit at Several Weapons by Middleton & Rowley; The Laws of Candy by John Ford. 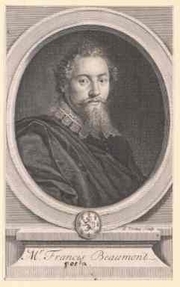 Francis Beaumont is currently considered a "single author." If one or more works are by a distinct, homonymous authors, go ahead and split the author. Francis Beaumont is composed of 1 name.